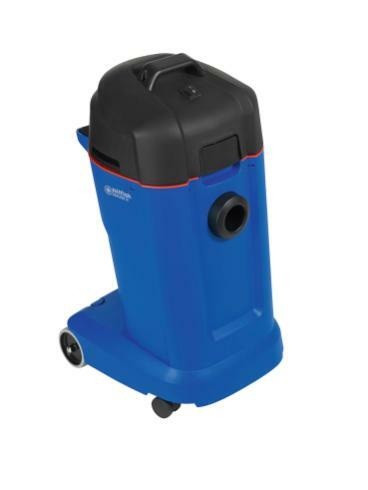 MAXXI II 35 offers easy and efficient wet & dry use without filter changing. The unique dual filter allows the machine to be used for both wet and dry applications without the need to change filters. Thanks to MulitFit connection the MAXXI II tools are compatible with all ATTIX accessories. The MAXXI II wet and dry vacuum cleaner presents a number of innovative design features making every day operation and maintenance easy, ergonomic and more productive. The specially designed hinged motor head allows easy and quick filter inspection without lifting off the motor. Furthermore, the motor head allows the container to be emptied without moving any components, thus avoiding damage or loss. When lifting the container, MAXXI II balances the weight allowing emptying of even filled containers of fluid effortlessly and without strain. The trolley on MAXXI II 35 has wheels fixed to the container.